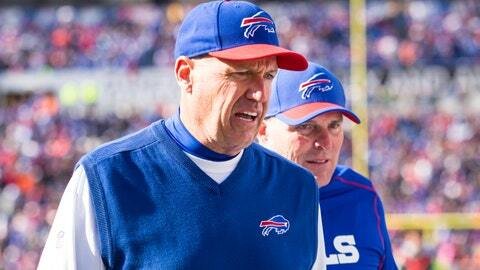 Rex Ryan said the Bills had serious headset communication problems in London. Rex Ryan and the Buffalo Bills had more than a few issues against the Jacksonville Jaguars on Sunday, and they are blaming Wembley Stadium for at least one of them. After his team’s 34-31 loss in London, Ryan said the Bills experienced some “unacceptable” electronic communication issues with their coach-to-quarterback headsets. Ryan said there was static with quarterback E.J. Manuel’s headset and multiple instances where the communication went out completely. Buffalo’s equipment staff could be seen making adjustments to Manuel’s headset more than once, including after an interception in the first half. Manuel said the issue was eventually fixed, but Ryan was obviously furious. “Just a frustrating time, obviously, in those circumstances,” he said. The Bills dug themselves into an early 27-3 hole and nearly came back to win. The Jaguars responded with a late touchdown from Blake Bortles to Allen Hurns that proved to be the game-winner. If we asked Pittsburgh Steelers coach Mike Tomlin, we know exactly who he would blame for Buffalo’s communication issues in London. We all know who was responsible in some way, shape or form.